This finish is my September goal for a Lovely Year of Finishes (you can read the goal-setting post here). 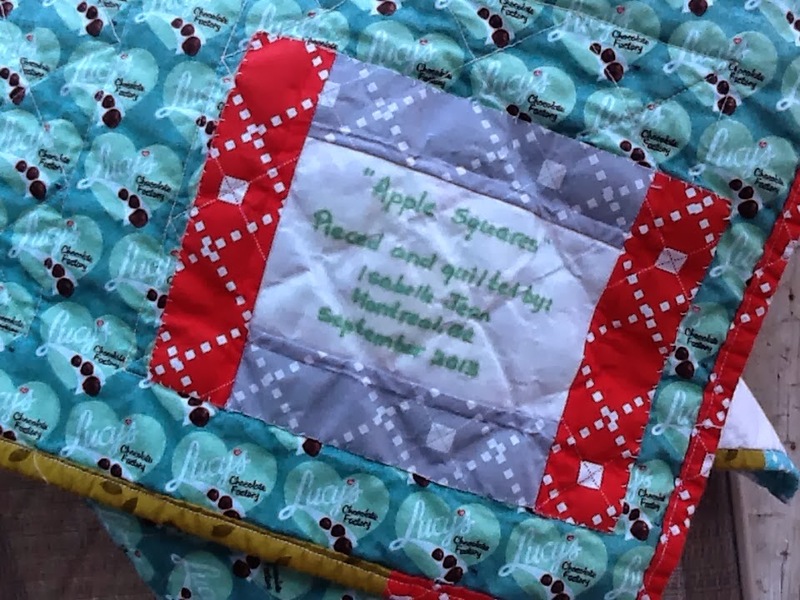 I'm calling this quilt "Apple Squares" because I used the Little Apples fabric collection by Aneela Hoey and the pattern of course is granny squares. It measures about 50" x 78". 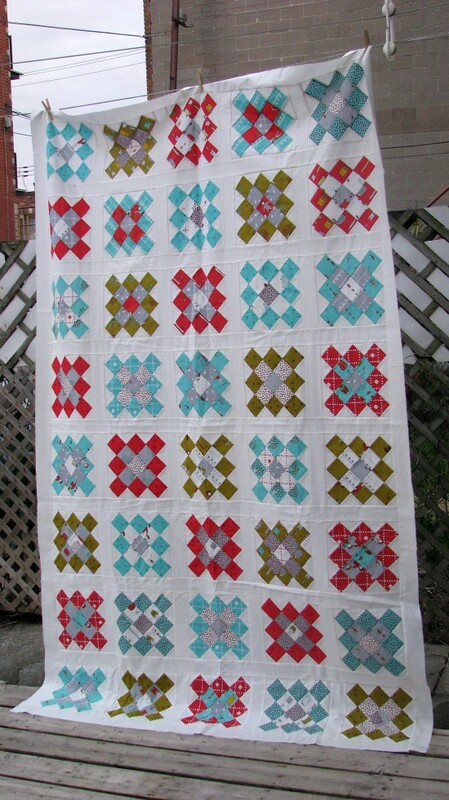 The background is Kona Snow and the binding is made from some leftover jelly roll strip of the same fabric collection. I quilted it with straight"ish" lines on the diagonal and I love the texture now that it's been washed. 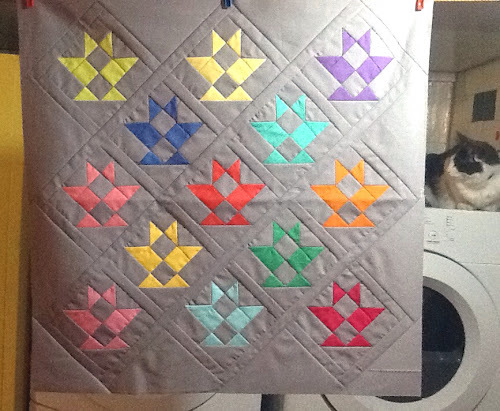 The backing is a really fun print I found at my local fabric store. And I made my own label (I learned how to do labels that way from reading Kelly's blog). I'm super happy with this finish and cannot wait to cuddle with it on the couch! 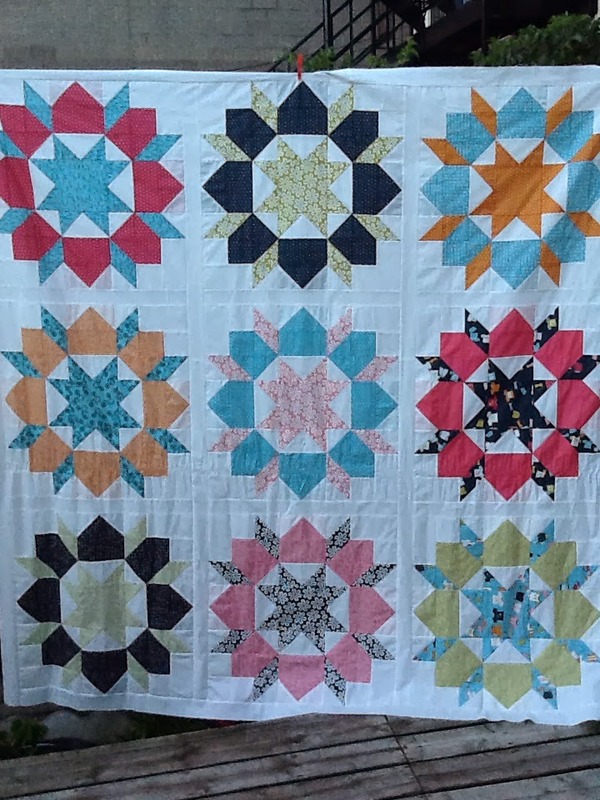 I will be linking up at My Quilt Infatuation, Crazy Mom's Quilts and TGIFF (which is over at Cherry Valley Designs this week). 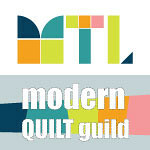 And of course, I'll be linking this finish over at ALYOF (button in my sidebar). Ta Da! A Swoon Top! I know I've been away from the blog for a little while. I don't really have an excuse for not posting other than life got in the way. I did get some sewing done though. And some of that sewing was finishing my Swoon top! Yay! I cannot believe I finally made a Swoon quilt top. 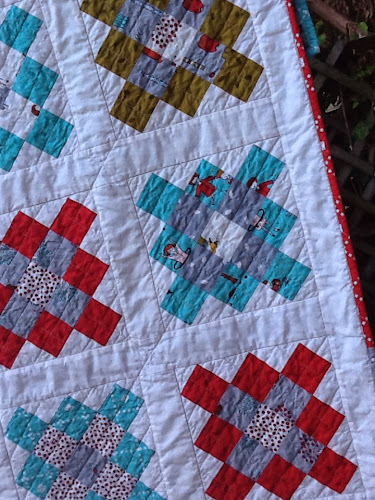 That quilt had been on my To Do list for so long. 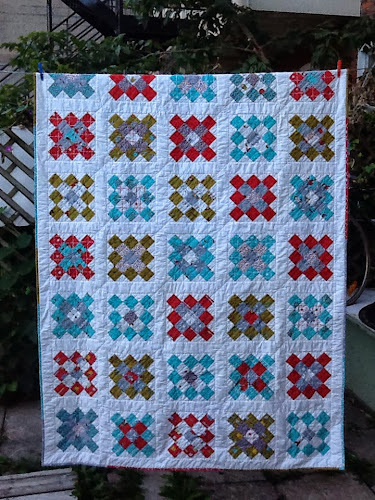 Now I just need to figure out how to quilt it. I want to do some free-motion designs, but it's so big. 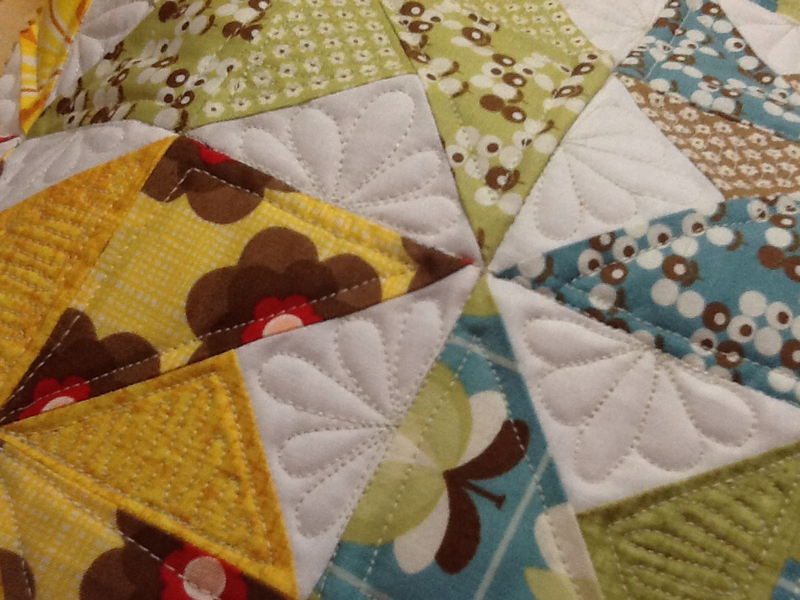 The last time I quilted something that big on my machine, I found it exhausting! 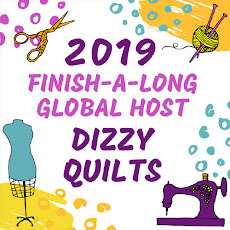 I will be linking up at these fabulous places this week: Crazy Mom Quilts, My Quilt Infatuation, and at Missy Mac Creations (hosting TGIFF this week). On and don't forget the Craftsy sale that ends this weekend! Craftsy Sale: Up to 75% Off All Courses, Fabric and Yarn! My June Schnibble is all done! I completed the piecing back in June and then the poor thing just sat there waiting for a back and some quilting. After finishing my Scrappy Trip a couple of weeks ago, I decided Dulcinea had waited long enough. I wanted to use Dulcinea to practice my FMQ skills so went with designs I had just learned in Angela Walters' new Craftsy class. 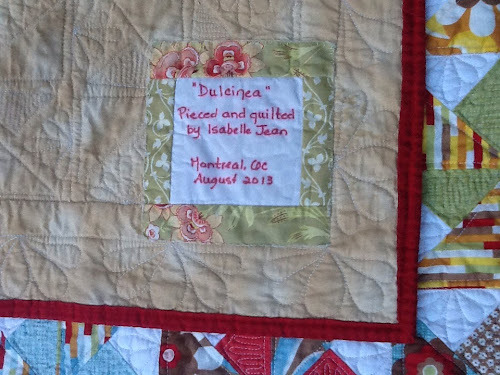 You can see a bit of the quilting in this picture of the back. And I often forget about the label, especially if the quilt won't be gifted, but this time, I thought a label would be a nice touch. This 3-day weekend has really helped me get focused and finish a few things. I will be linking up at Lee's for WIP Wednesday so here's a run down of what I'm working on this week. Number 1 is Dulcinea which is now all quilted. I need to put the binding and label on and call it finished! Number 2 is my Circle of Geese wall hanging. 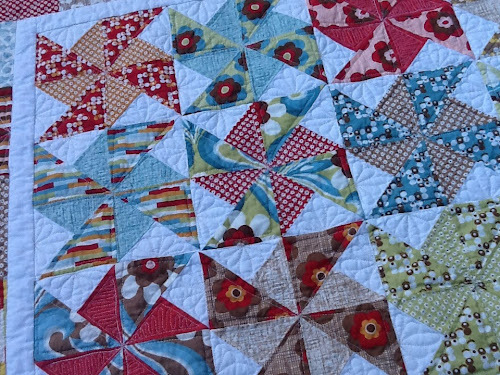 I started working on another block this week and since I have about a dozen little baskets left from my Canasta mini quilt, I'll try to come up with some kind of setting for 4 Circles and the 12 baskets. Number 3 is the Star Surround QAL over at Happy Quilting. I've got the top all done but would really like to quilt it in time for the parade on the 15th. And last, but certainly not least, I've been working on my Swoon quilt. 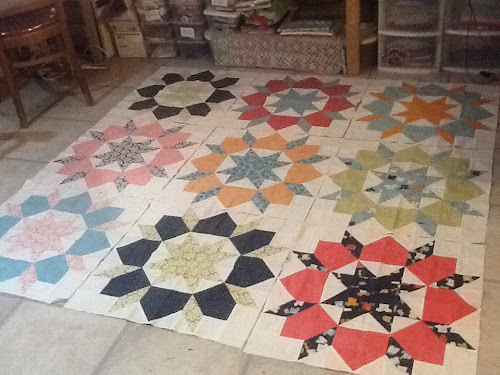 I've got all 9 blocks pieced and I've chosen the layout. 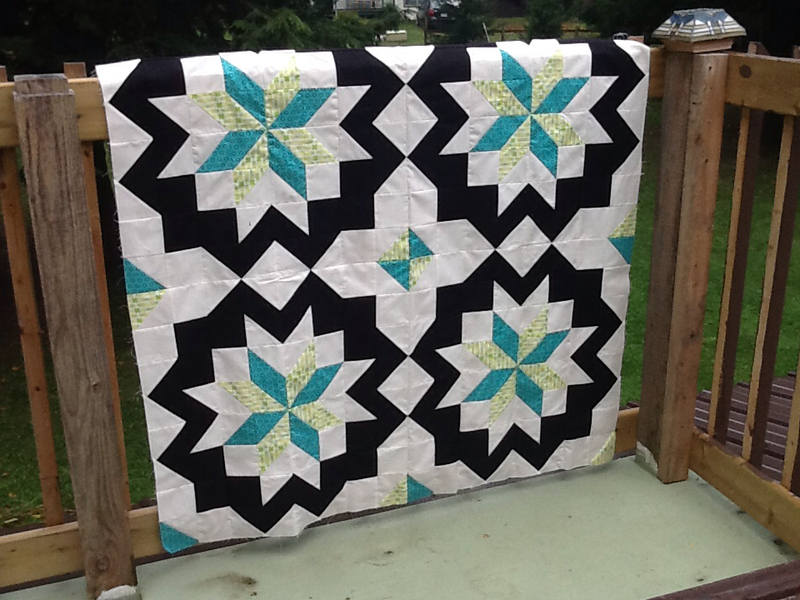 I'm going to try adding the sashing this week, but the quilting of this beast will probably have to wait a few weeks. I didn't think I would be able to finish Canasta to be in this month's parade over at Sherri's and Sinta's. Once again, I overestimated the time I would be able to spend making my Schnibble and underestimated how long it would take to piece these little blocks. BUT the universe was on my side because the parade won't be up until tomorrow! Yay! 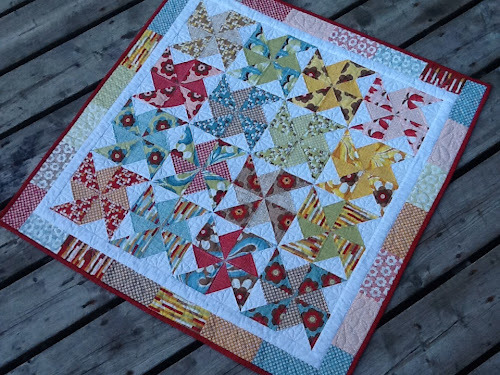 I went with solids to piece Canasta and decided to make the smaller version without the borders. 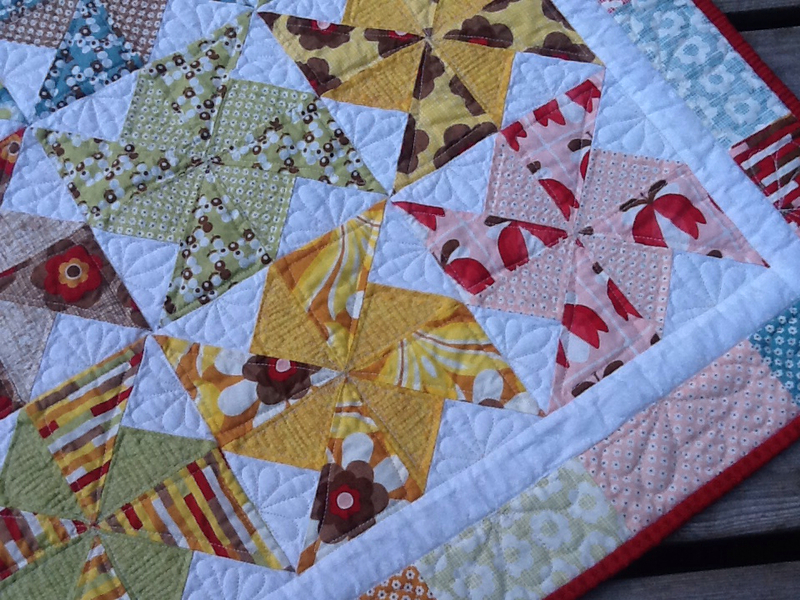 I think it'll look great with a bright solid binding once the quilting is done. Make sure you visit Sherri and Sinta tomorrow to see all the different Canastas out there. I've already seen a few and they are gorgeous! 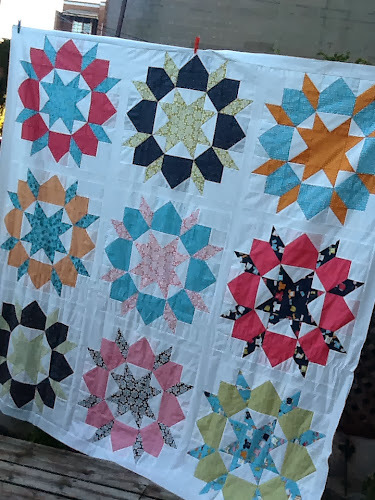 I've having a really hard time meeting deadlines lately for my quilting, but setting a monthly goal of just 1 finish seems to help me get focused. In August, the only finish I managed was my LYOF goal, so here I am with a goal for September. This month, I plan on finishing up my Granny Squares quilt. I need to find an appropriate backing, baste it and quilt it. It's pretty big, so I'll probably stick to some straight lines for the quilting. Linking up at Fiber of All Sorts and Bittersweet Designs (link in my sidebar).